It’s not only parents and special guests that have been perusing the Wooranna Park Primary School grounds of late. Journalists, US software developers and ‘cryptocurrency’ specialists from Malaysia have also been taking a vested interest in what’s been going on behind classroom walls. Indeed when Australian Teacher Magazine chats to teacher Kieran Nolan about the Victorian primary school’s work with emerging digital currency systems, it’s hard to keep up with the lingo. The ex-engineer turned educator says that in a nutshell, students have been using Blockchain technology to build their own security-encrypted digital currency dubbed “WoorannaCoin”. While it sounds like a technical feat so radical that it almost defies common understanding, Nolan says Bitcoin (Google it), Blockchain and other digital systems are simply the new kids on the financial block. “I kind of equate Blockchain technology with the internet” Nolan muses. Nolan has taken it upon himself to teach Wooranna Park’s children and staff how to master the software behind the alternative platform for online transactions. His efforts, it seems, have caught the world’s attention. Earlier this year, Wooranna Park welcomed US-based software developer and investor Andrew Kwon to see their work in action. Thoroughly impressed, Kwon donated 21 bitcoins (equivalent to $30,000 at the time) to his host. 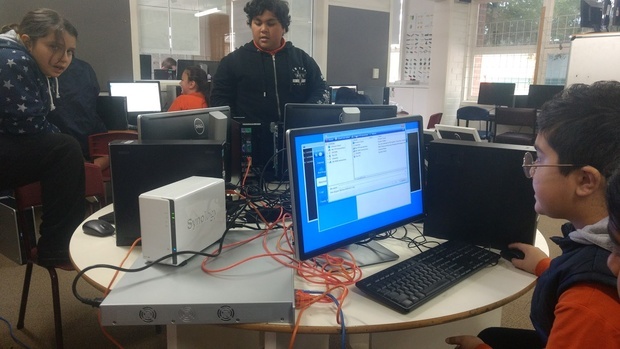 It’s understood to be the first ever bitcoin donation made to an Australian school. “The other thing that we’re doing at the moment is using the NEM Blockchain,” Nolan reports. The Blockchain technology has also offered a valuable lesson in online security and how one’s data might be owned, manipulated and controlled. Unlike Facebook, Twitter or YouTube, Blockchain is not regulated by one central authority, meaning Nolan’s students essentially have the power to control their own data. Exploring their new agency, the children have been using Blockchain to build an open and secure voting system for the school, giving everyone a means to direct how things are done. Take Kwon’s donated bitcoins, for starters. Using their self-built polling system, students voted on how their donation should best be used. The “immutable” results showed the majority were in favour of acquiring some new makerspace gadgets.